One of the most important – and most frustrating – things about tax season is learning the new changes to how you’ll have to go about filing your taxes. Some things are consistent, but forms can change. Form 1040 is one that has undergone some changes you need to know for this year’s taxes in particular. You may be wondering the intricacies of what separates the Internal Revenue Service‘s standard 1040 with variations you’ve heard about, the 1040A and 1040EZ. 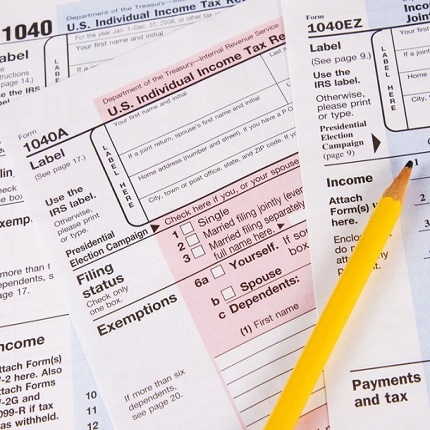 The IRS has made significant updates to how information for your 1040 is filed. These changes make the 1040A and 1040EZ essentially obsolete, although the information needed for them is still relevant to the updated form. Before we get to that, let’s answer the first question: what is the 1040 and what’s the difference between that form and the 1040A? Form 1040 is the basic IRS form needed to file taxes, the form in which your taxable income for the year is calculated. In addition to basic information (name, filing status, Social Security number, dependents) the 1040 form has room for your wages and salary as well as other forms of income, such as taxable interest or amounts of pensions and IRAs. After calculating total income and adjusted gross income, there are lines for tax deductions, should you be able to claim them. This allows for standard deductions and, if one qualifies, itemized deductions. Expenses that can qualify as itemized deductions include mortgage interest, investment interest and medical expenses. If you are eligible for tax credits, the 1040 form is also where you would claim those. Though just a two-page form, the 1040 can be a little complex if you’re filling it out yourself and qualify for a number of deductions and credits. If you’re using tax software to file, the information you provide will likely automatically be put into your 1040 through the software. The 1040 form also, at the end, lets you calculate if you are eligible for a refund or if you owe additional taxes. One other version of Form 1040 that still exists is the 1040-NR, which may need to be filed if you are a nonresident alien who did business of some kind in the U.S. or represent a deceased person or estate that otherwise would have had to file the 1040-NR. Prior to this coming tax season, the 1040A and 1040EZ were options in lieu of the 1040 for those with less than $100,000 of taxable income and fewer specifics to deal with. They were each much shorter than the 1040. On the 1040A, the number of available tax credits and deductions is much more limited. Most notably, you were not able to itemize deductions on the 1040A. However, those who filed a 1040A were able to do it regardless of status and could still claim dependents. It also had a similar variety of incomes to the 1040. The 1040EZ form was even shorter than the 1040A. You were not able to claim any tax deductions or tax credits (aside from the earned income tax credit). The types of taxable income one could have were far more limited, and you could only use it if your filing status was single or married filing jointly. You cannot claim dependents. The details that separated the 1040A and 1040EZ from the 1040 form confounded many taxpayers for years. But if you’re preparing all of your tax stuff from 2018, you should know that the IRS has done away with the 1040A and 1040EZ forms, instead creating a more streamlined Form 1040. This makes things easier for people with simple tax returns – simply fill in the necessary information for your 1040 instead of looking for the other form you may be able to use. But what if you actually have a more complex tax return that benefited from the lengthier 1040 form, what do you do now? Part of this revamped 1040 form includes six different “Schedules” that can be attached to the initial 1040 to provide additional necessary information. With these schedules, you can supplement your new 1040 with crucial info to potentially help you get further tax deductions and tax credits, and potentially a better tax refund as well. SCHEDULE 1 – Schedule 1 lets you add additional sources of or adjustments to income that aren’t on Form 1040. Income sources on Schedule 1 include capital gains, alimony received, unemployment and rental real estate. Gains from prizes or gambling winnings can also be filed here. Adjustments to income can include paid alimony, self-employment tax, student loan interest deductions, educator expenses and health savings account deductions. SCHEDULE 2 – The Schedule 2 form is included if the taxpayer owes the Alternative Minimum Tax (AMT). Schedule 2 also factors in if the taxpayer has to make an excess advance premium tax credit repayment. SCHEDULE 3 –Schedule 3 is required for those who wish to claim nonrefundable tax credits that are not on the 1040 form. Something like the child tax credit is covered in Form 1040, as are refundable tax credits, but the foreign tax credit, education credit, residential energy credit, retirement savings contribution credit and general business credit can be claimed with this schedule. SCHEDULE 4 – Other taxes that are not included on Form 1040 are in Schedule 4. These taxes include the self-employment tax, health care taxes, household employment tax, unreported Social Security and Medicare tax and any additional taxes on IRAs or other qualifying retirement plans. SCHEDULE 5 – Schedule 5 is known as “Other Payments and Refundable Credits.” The payments in “other payments” can include amount paid with a request for an extension to file and excess Social Security tax withheld. This is also where one can claim refundable claims that aren’t already on Form 1040 (such as earned income credit). SCHEDULE 6 – Schedule 6 is used for taxpayers who have a foreign address or a third-party designee (this does not include a paid preparer). Input the necessary information for your foreign address (country, province and postal code) or your third-party designee (name, phone number and PIN). These six schedules help make even more complicated tax returns easier and more efficient for those claiming more than your average taxpayer, much in the same way the new 1040 form is designed to make simple tax returns easier. Individuals and small businesses can benefit from tax planning during the year and before entering into transactions to be make tax time easier. Small business owner’s personal financial situations are intimately linked with their businesses. We can work with you to prepare your business or personal tax returns and take the stress out of the process. Click here to contact us today!